Taikan Yokoyama was born in 1868, the first year of the Meiji Period. To commemorate both the 150th anniversary of his birth and 60th anniversary of his death, the Yamatane Museum of Art is showing its entire collection of his work for the first time. Taikan Yokoyama: The Elite of the Tokyo Art World begins with a look at the start of the artist’s career. At age 21 he enrolled in the first graduation class of what is now Japan’s top art school Tokyo University of the Arts, where he studied Nihonga Japanese-style painting under Gaho Hashimoto and became a favourite pupil of principal Kakuzo (Tenshin) Okakura. Yokoyama went on to found the Japan Art Institute (Inten) with Okakura and others in 1898. It was during this early Meiji period that Nihonga developed as an art form. These works were distinguished from Yoga Western-style painting, which were produced using European approaches and materials. The Japan Art Institute founders strove to reconsider the techniques of traditional Japanese painting, which relied heavily on line drawing. They developed new methods to express light and air by eliminating outlines and concentrating on colour combinations and pigment gradation. These attempts to reinvent Nihonga weren’t plain sailing, however. Their style was nicknamed morotai (“vague” or “indistinct”), with plenty of derogatory connotations in this understated moniker. Nevertheless, these efforts to create a new form of fused Japanese expression led to Yokoyama becoming a key figure in the Tokyo art world. 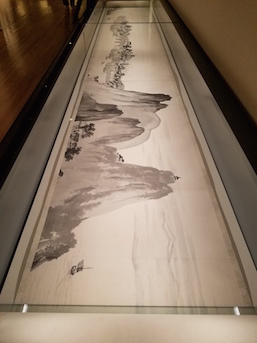 His first ink scroll paintings, the Rivers of Chu Scroll (1910) and Mountains of Yan Scroll (1910), display Yokoyama’s command of light and dark ink with a perspective not usually found within the style. The exhibition continues chronologically, examining the essence of Yokoyama’s art after 1914. Having established a leading role in Japan’s art world in the 1910s and 1920s, he led a delegation to the Japanese Art Exhibition in Rome in 1930. In 1931, he was appointed Imperial Household Artist and in 1937 he received the First Order of Culture and was enrolled into the Imperial Art Academy. The exhibition also showcases work by other artists instrumental in the development of Nihonga, both Yokoyama’s contemporaries and those who followed him: Yukihiko Yasuka and Kokei Kobayashi were part of the re-established Japan Art Institute, and Hoshun Yamaguchi and Kaii Higashiyama were active in the Japan Fine Arts Exhibition (Nitten). All are connected through relationships with Taneji Yamazaki, the museum’s founder. Nihonga artists are under represented in international collections, so exhibitions like these in Tokyo are a great way to gain an understanding of this pivotal art movement representative of its era. 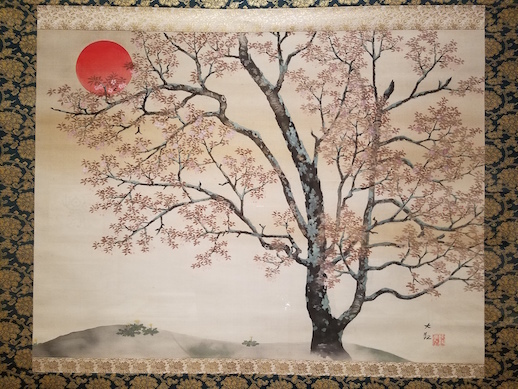 Nihonga from Yokoyama’s era is both distinctively modern and archetypically Japanese, and this discount-eligible show is a fantastic opportunity to see the evolution of that language from one of its pioneers. The experience of this exhibition is not over once you have finished viewing the artwork. 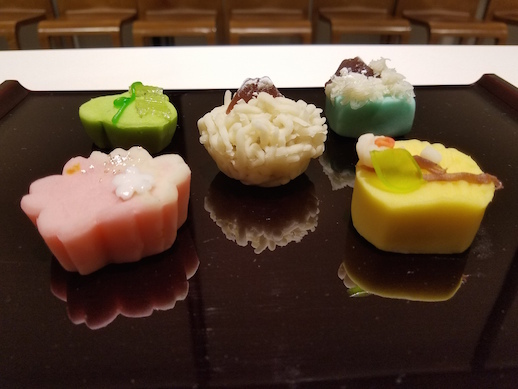 Head to Cafe Tsubaki on the first floor and enjoy some wagashi Japanese sweets inspired by several artworks from the show. Made by the Aoyama confectionary Kikuya, which dates back to 1935, these treats offer a unique way to indulge in Japanese art and culture.